Caprion Biosciences state-of-the-art quality management systems (QMS) defines the high-level quality policies for all activities of our laboratory services. In accordance with applicable GCP/GLP/GCLP regulations and guidelines, ISO standards and GMP accreditations, our quality management program is implemented at all levels of the organization where studies are planned, conducted, monitored, reported, and archived. Caprion is also registered by CLIA for specific testing methods and committed to providing the highest quality in the execution of all projects. 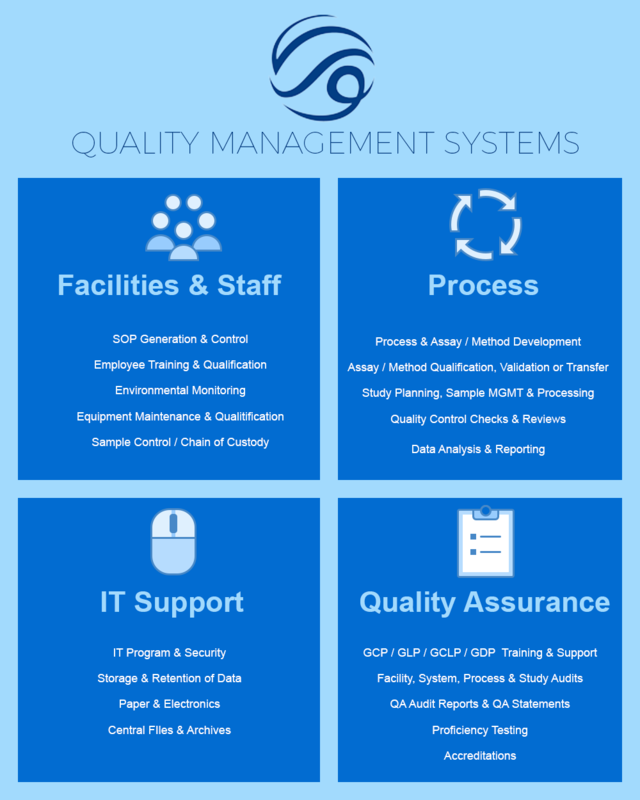 Quality Management Systems (QMS) policies for all activities encompasses the organization and facilities, safety and personnel, computer systems and equipment, sample management and chain of custody, assay/method qualification and validation, study planning, sample processing and data analysis, reporting, document control, storage and retention of data. Processes and Procedures for Caprion’s QMS are performed by highly qualified and trained personnel and recorded in controlled documents such as study work plans, Standard Operating Procedures (SOP), Client Specific Procedures (CSP), and study worksheets/forms. All documents are approved prior to use. Customized Assays that meets our sponsors study requirements, are planned, developed and qualified and/or validated prior to implementation. Result Reporting format and mechanism for data reporting is developed in unity with the sponsor to ensure the highest quality of interpretation, correlation, and effective communication of test results. Quality Control (QC) reviews ensure the performance of all laboratory testing for immune monitoring is controlled through the use of accepted quality control practices and documented procedures. Quality Assurance (QA) audits performed by the Quality Assurance Unit are in accordance with GLP/GCP regulatory requirements, study plans and applicable procedures; in order to measure and monitor the performance of laboratory services, and to identify opportunities for improvement. Proficiency Testing practices allow for the standardization of selected assays among laboratories, as required by the CAP & CLIA certification.